Specjalnie przygotowane Jupitery znów stanęły na starcie 24 godzinnego wyścigu w Le Mans. Becquart and Wilkins zwyciężyli w klasie 1100-1500 cm³. 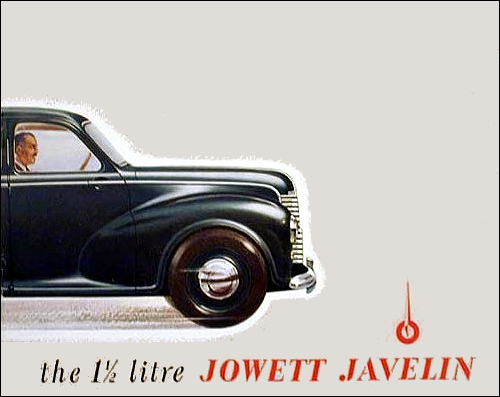 The Jowett company-founded by Benjamin and William Jowett and A. V. Lamb on £30 had completed fifty years. The successful Jupiter is continued with detail modifications including a redesigned fascia/instrument panel. A special-bodied Jupiter version by J. J. Armstrong of Carlisle. 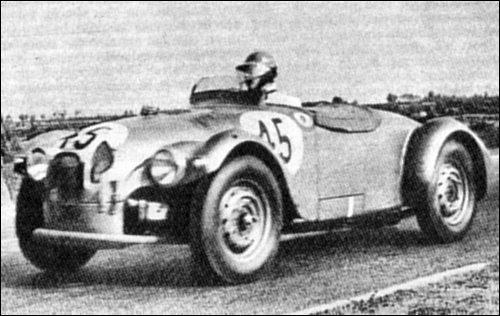 Other specialist coachbuilders also adapted the Jupiter chassis, including Abbott of Farnham, J. E. Farr & Son of Blackburn and Richard Meade of Knowle, Warwicks. 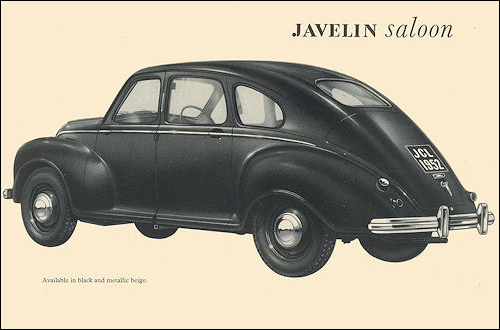 Engine and gearbox problems finally resolved Javelin in 1952. 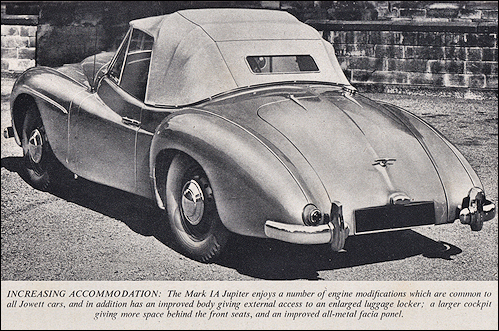 Top speed of 88 mph with 62 bhp, Jupiter MkIA from 1952 which also has re shaped wings. 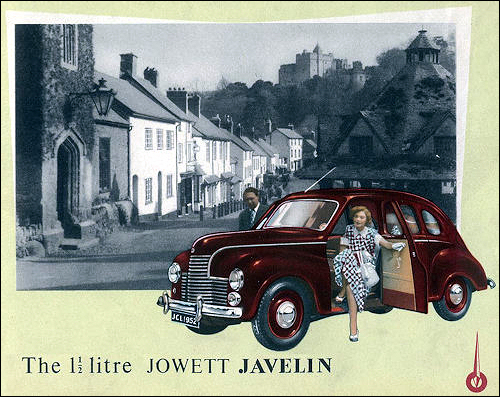 The Jowett Javelin saloon and associated high-speed two-to-three-seater Jupiter cars (which are the only British production models incorporating torsion bar suspension front and rear, and horizontally opposed four-cylinder engines), are to be continued basically unchanged in the coming year. In the case of the Jupiter, however, a number of changes have been made in the body layout, and in the case of the Javelin a number of changes have been made in engine design. 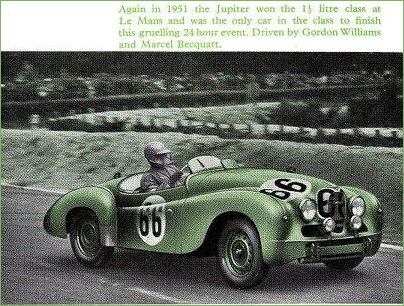 Steady participation of the Jupiter in sports-car racing, in which they have inter alia won the 1½-litre class at Le Mans in three successive years, has given the makers a wealth of experience under exceptionally arduous conditions. During the past two seasons particular attention has been given to improvements in bearing life and cylinder-head sealing, and a number of changes have been embodied in the course of this work. In the first place, the crankcase itself has been stiffened, and increased oil flow derived from the larger capacity of the oil pump has been accompanied by a modification to the oilways within the crankcase. To match this change the oil drillings in the crankshaft itself have also been modified and the crank stiffened so as to eliminate any possibility of failure through fatigue or from high r.p.m. Both main and big-end bearings are now of the Vandervell three-layer type in which a flash coating of indium, forming the actual rubbing surface, is backed by a copper-lead overlay upon the flexible steel shell. These changes, in conjunction with the hard steel shaft, have been very successful. A further change in the engine has been the fitting of a new type of sealing ring at the bottom end of the cylinder liner. The cylinder head has polished ports and combustion chamber. 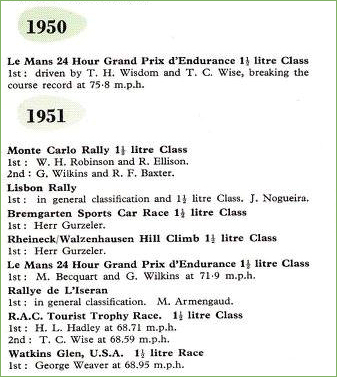 The design of the pistons has been modified and all these changes make an unusually positive record of how racing improves the breed, for they are all incorporated in the Series III engine which now, developing 52.5 b.h.p., is used in the standard Javelin saloon. It will be recalled that the very nature of the flat-four engine makes it possible to use a very high percentage of the wheelbase for passenger and luggage accommodation. Indeed, if the latter be included there are 118.5 in. from the pedals to the rear end of the locker as compared with 102 in. for the wheelbase. 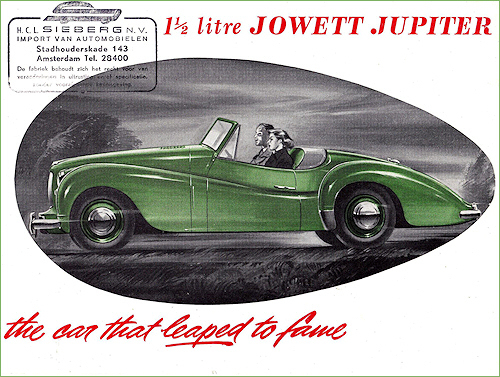 The Jupiter engine has, of course, all the improvements which have been set out when describing the Series III Javelin power unit, and it is offered with a choice of two compression ratios and in normal form develops 62.5 h.p. 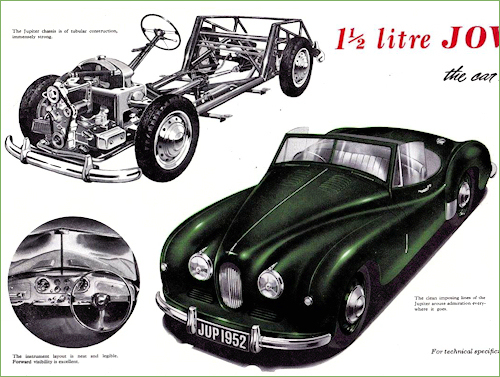 This greater output is achieved in part by the use of twin downdraught carburettors of larger size, and in recognition of the fact that the engine will be called upon to deliver maximum output for longer periods than in the case of a touring type a large capacity oil cooler is incorporated in the circulating system. 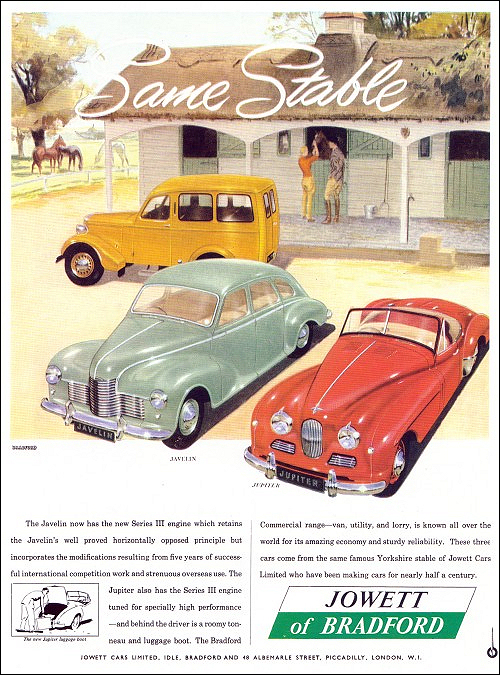 But the principal development for 1953 has been aimed not at increasing the performance of the car, but in raising the general level of the amenities as a touring model. The Mark I series which went into production after the London Motor Show of 1949 suffered somewhat from the inadequate and inaccessible luggage locker. On the Mark IA Jupiter the luggage locker itself is instantly accessible by raising a locker lid hinged at the top. This also discloses the mounting for the spare wheel which lies beneath the sloping floor of the locker which is carpet covered. This new position for the carriage of large items of luggage has freed a useful space behind the bench-type front seat for the carriage of smaller items, and it may be said that the open well of the cockpit behind the front seats is more than 50 per cent. larger than on the previous type. It is therefore now possible to load the Jupiter not only with two persons but also with personal effects adequate for a long-distance tour. 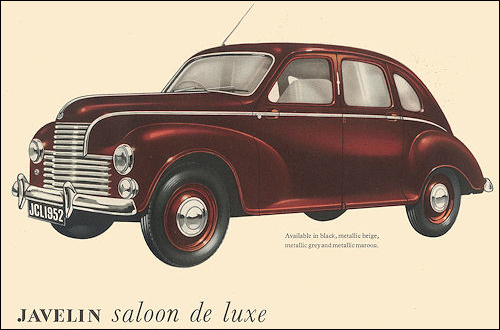 This change has not affected the general shape of the car which remains a most attractive combination of flowing lines bearing the traditional stamp of separatism so far as the bonnet, lamps, and mudguards are concerned. 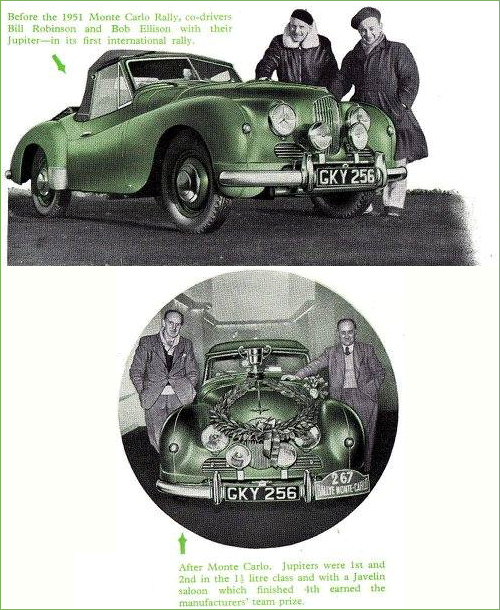 A further notable improvement in detail is the new facia panel which, being in metal, is more suited to a convertible car which is especially pleasurable when used in open form. The large-diameter speedometer and tachometer are now placed to the left and right of the centre line respectively, with fuel gauge, ammeter, oil and water thermometers, and oil-pressure gauge, lying between them. A closed but un-lockable "locker" occupies the right-hand side of the panel, and if a radio set is fitted the corresponding left-hand area is used to receive the control gear. 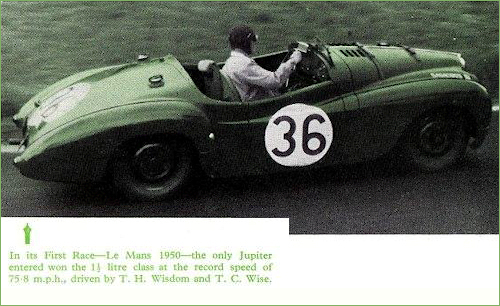 Jupiter R1 at Le Mans.